The European Commission has given the green light to Barclays' proposed takeover of Dutch bank ABN Amro, saying the deal posed no competition risks. The decision came as Barclays formally launched its 65bn euro ($89bn; £43.6bn) takeover bid for the group. Barclays is hoping its offer will beat a 71bn euro bid tabled by a consortium led by Royal Bank of Scotland. 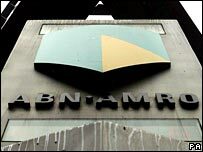 ABN Amro has refused to back either offer, in order to ensure "a level playing field" between the bidders. In a statement, the Commission said it had given Barclays the green light to buy ABN as the British bank was " not active in retail and corporate banking" in the group's domestic market. "ABN Amro's activities in these markets in the UK are marginal," it added. The news came as Fortis investors in Belgium and the Netherlands voted overwhelmingly to back the Belgian-Dutch bank's participation in the RBS-led bid. More than 90% of shareholders present at meetings in both countries backed the move, a result welcomed by Fortis chairman Maurice Lippens as "a massive vote". Their backing is seen as being pivotal to whether the RBS consortium - which also includes Spanish bank Santander - will ultimately win out in the battle for ABN. At the respective meetings, Fortis investors also backed plans for the bank to issue 13bn euros in shares to fund its part of the deal. The RBS-led group sweetened its offer last month, upping its cash element from 71% to 93% in an effort to win over shareholders. A bidding war for ABN Amro broke out between the two UK groups earlier this year. ABN had originally supported the Barclays offer, a stance which was viewed as a crucial factor in Barclays winning the fight against RBS, but withdrew its backing last month. Under Barclays' current proposed cash and share offer, ABN investors will receive 13.15 euros in cash and 2.13 new Barclays shares for each ABN share. The offer period runs from 7 August to 4 October, Barclays said.